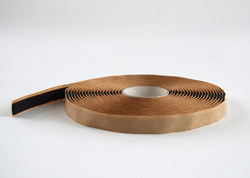 Prominent & Leading Exporter from Mumbai, we offer tacky tapes. We are manufacturing and exporting Tacky Tape to our clients. The offered product is fabricated in conformity with globally accepted standards using quality approved raw material with the help of highly advance technology. In order to satisfy the varied demands of our esteemed clients, this product is available in flexible modified options. In addition to this, our tape is vastly demanded in domestic markets.